Philippe Bracke and Silvana Tenreyro. When someone bought a house turns out to be an important factor in predicting whether the house will be sold again soon, and at what price. People who bought during a boom aim at achieving higher prices when they sell and, as a consequence, move less often. We explore whether this pattern is due to psychological anchoring (whereby the previous purchase price becomes an important reference point) or to the way the mortgage market works (for example, with homebuyers often using proceeds from house sales for down-payments on new properties). In a recent Staff Working Paper we document a material impact of the aggregate house price level in the year a house was previously bought on the probability of sale today and the price if sold. Consider two identical houses put up for sale in the same location in 2014, one previously acquired in 2007, when aggregate prices peaked, and the other in 2001, when prices were much lower. 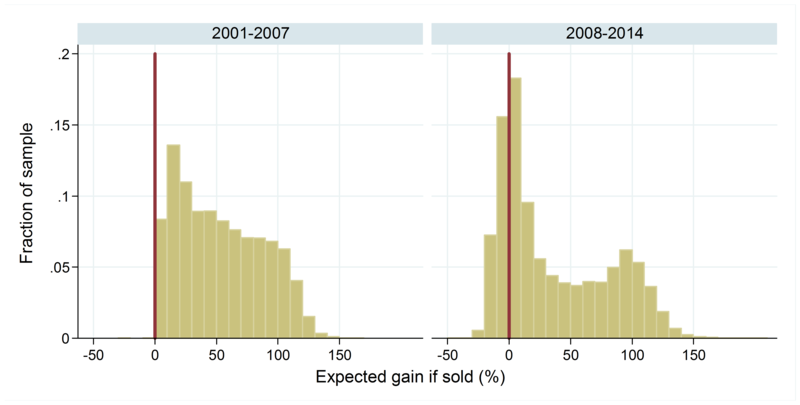 All else equal, the house bought in 2007 will sell with 15 percent lower probability but at a premium of over 10 percent over the one bought in 2001 if sold. Such a role for past aggregate prices in housing markets is clearly at odds with a standard economic model in which the value of a house and its likelihood to sell depend exclusively on the future rents (actual or imputed) the property delivers. A possible interpretation of the results is the notion of anchoring or reference dependence: in estimating the current value of their house, owners tend to give excessive weight to the price they paid (vis-à-vis the market evolution of prices); if they bought at high prices, this will lead to higher advertised prices and lower selling probability. A competing explanation is the so-called down-payment effect: for home movers, a large percentage of their deposit comes from the sale of their previous home. Hence, owners who bought at high prices will have, all else equal, less home equity; they will then try to sell at a higher price and be less likely to find a buyer than owners of comparable houses bought at lower prices. Our results on history dependence are based on data on all individual housing sales from the England and Wales Land Registry (twenty million housing transactions), which cover the years from 1995 onwards. We compare properties of the same type (flats, terraced, semi-detached or detached houses) sold in the same year in the same local authority. The properties differ on the year in which they were bought and hence on the expected gain or loss to be realised in case of sale. To make sure that we compare like with like, our statistical model uses two additional indicators of property quality: the previous purchase price (adjusted for the year in which the house was bought) and the number of years since purchase (because longer holding periods are mechanically associated to higher gains and, potentially, to different levels of physical maintenance of the property). Figure 1 shows the outcome of our estimation. In both charts the horizontal axis represents the size of the expected gain (or loss) of a given homeowner, with the red vertical line indicating break-even – expected gains and losses are grouped into bins (losses between 25 and 15 percent, losses between 15 and 5 percent, and so on) and are measured using house price indices at the local authority level, at the moment the house was purchased and in the current year. 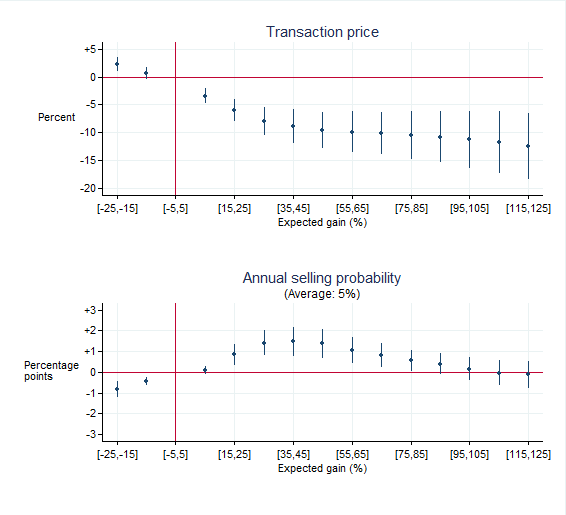 The vertical axes in Figure 1 show the associated premium (or discount) in transaction prices (upper chart) or selling probability (lower chart), compared to an identical property in the same local authority and year, but with zero expected gains. The effect on transaction prices is measured as a percentage; the effect on selling probabilities is measured in percentage points. In the upper chart, expected losses of up to 25 percent are associated with a price premium of around 2 percent, and expected gains are associated with a discount, consistent with the idea that owners expecting a loss will try harder to achieve a good price. The lower chart shows that expected losses induce lower selling probabilities and expected gains elicit higher selling probabilities, but the effect flattens out for large gains. The coefficients eventually turn slightly negative for very large expected gains (above 125 percent) – we have not included these estimates in Figure 1 because they refer to a restricted number of places in London and the South East, and to properties that were bought many years ago. History dependence can have noticeable effects on the aggregate UK housing market. As illustrated in Figure 2, the post-crisis period led to a collapse in the volume of housing transactions in England and Wales. Transactions reached their peak in 2007 and then declined sharply. 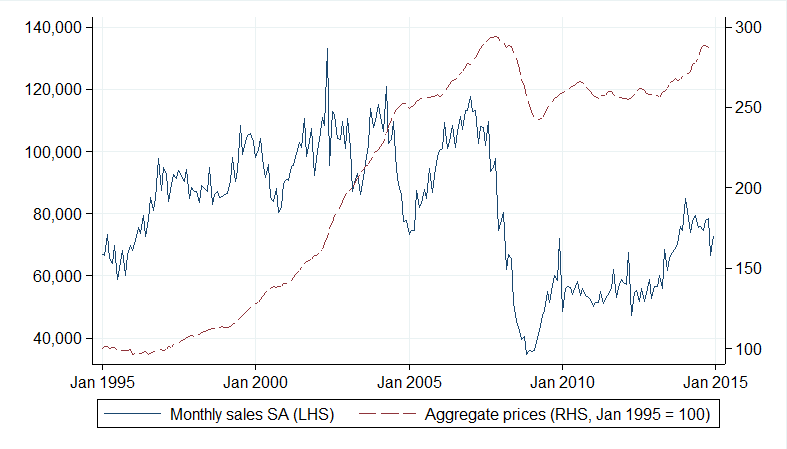 Prices reached their peak slightly afterwards, subsequently fell, and only after 2009 experienced a resurgence. Up until 2007, homeowners had gotten used to high levels of capital gains on their properties. But capital gains stalled around 2007. Indeed, it took 8 years for prices to get back to their 2007 level (obviously there have been differences between regions; most notably homeowners in London have seen more capital appreciation). If expected capital gains are an important element of homeowners’ decision to move, the 2007 fall in house prices could be a likely factor accounting for the slow recovery of housing transactions in the subsequent years. To test this hypothesis, we first estimated the distribution of expected gains and losses in the seven years before the 2007-2008 house price fall (2001-2007), and after (2008-2014) – these two distributions are displayed in Figure 3. Again the red vertical line represents a situation with no gains or losses as measured by local-authority house price levels. In the pre-crisis period there were no homeowners with losses; in 2008-2014 part of the distribution shifted to the left of the red line. The mass of homeowners in the centre of the distribution with gains between 25 and 75 percent hollowed out after the crisis. For each gain/loss group, we measure the change in the fraction of homeowners in that group between the pre- and post-crisis period, and multiply these changes by the coefficients on selling probabilities implied by the results shown in Figure 1. By summing all these contributions, we get at an estimate of the effect of the change of the gain/loss distribution on the aggregate number of housing transactions in the market. The average annual selling probability for a house was 7 percent in 2001-2007 and became 3 percent in 2008-2014 – a fall of 4 percentage points. A back-of-the-envelope calculation suggests that the contribution of history dependence to this fall was 0.4 percentage points, around 10 percent of the total fall in selling probabilities. Are these outcomes due to anchoring or the down-payment effect? To disentangle the two mechanisms, we repeat our analysis on a sample of properties purchased exclusively with cash, for which the down-payment effect should be muted. We find strong evidence of past aggregate prices affecting current housing market outcomes in this cash-only sample. Hence, although we find that leverage accentuates history dependence to some extent, the anchoring mechanism seems to explain a larger fraction of the effect of history dependence on transaction prices and selling probabilities. Anchoring can make aggregate house prices more resilient to shocks, since people would keep their current house for longer rather than realise a loss. This behaviour has the benefit of reducing the chances of a severe house price crash. Conversely, however, anchoring might reduce geographic mobility, which might be helpful for economic recovery. The existence and magnitude of anchoring effects in the housing market raise interesting trade-offs for policy makers. On the one hand, policies that increase prices today have the potential to spur housing market activity. On the other hand, if house price growth later became unsustainable market activity may quickly fall again in the future. Philippe Bracke works in the Bank’s Structural Economic Analysis Division and Silvana Tenreyro works at the London School of Economics.